He has always been adamant that the festival is not elitist, insistent that certain events should be affordable to all - this year includes a series of £10 orchestral concerts. 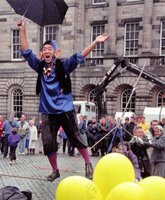 He is deeply irritated by the People's Festival, an alternative political initiative, first launched in 1951 by trade unionists and members of the artistic community who felt the international event was too inaccessible for many of Edinburgh's citizens. It ran for four years and was relaunched in 2002, with support from the Scottish Socialist Party, staging a series of concerts, comedy shows and exhibitions on the city's edges. "It seems to me to be patronising to lots of people. It says, look, you can only accept the second rate or something done especially for you. Actually, no, excellence is for everybody. Beethoven's fifth symphony: people can respond to it as an ad on television, why can't they respond to the whole thing? Why can't they respond to a great performance of it? Of course they can, everybody can. So you can come and hear a great performance this year for 10 quid." In his last year as festival director, Brian McMaster is offering every one of Beethoven and Bruckner's nine symphonies, but in concerts where that is the sole work. Of course, in a festival that is teeming with musical and theatrical events, the chance to savour these scores in isolation might make for refreshing listening. How has McMaster come to programme in this way? "We live," he says, "in a new age of cultural tourism. The opportunity to experience uniquely all the Bruckner symphonies, for example, and study a composer in depth is both particularly relevant to the festival experience and one that audiences respond to. It's true that Bruckner is less than fashionable, but that only makes it even more of an adventure. I really do believe that sitting at home and listening to the CDs is not the same thing; there's nothing like the live experience of being in a hall with musicians and committed conductors." 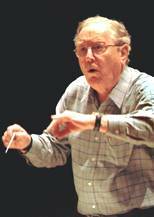 While there is something wonderfully touristic about going to the festival to "do Bruckner" under the baton of diverse musicians, the Bruckner series may be less fascinating and unified than the Beethoven, because that cycle will be masterminded by one conductor, the dynamic Sir Charles Mackerras (right), working with the Scottish Chamber Orchestra. This should produce a truly organic reading. Other visiting orchestras include the Finnish Radio Symphony, the Orchestra of St Lukes, and the Gustav Mahler Jugendorchester. The big name bands are on the European festival carousel, with the Berlin Philharmonic playing two Proms and one Edinburgh concert on successive nights, while the BBC Symphony play Bruckner 9 in London and Edinburgh again on consecutive evenings. The excellent Festival website includes a podcast interview with Brian McMaster, and audio samples of Beethoven and Bruckner symphonies. Image of the omnipresent Edinburgh Festival fringe from Wikipedia.de. I was fortunate enough to work in Edinburgh for four years in the 1980s. The Festival was literally on my doorstep, and the sound of the street performers in Rose Street used to reach me through my open office windows.